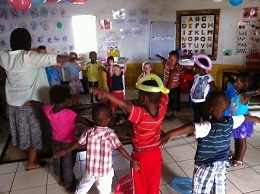 Zithulele pre-school had much to celebrate on the 4th of May this year when it’s 2nd birthday coincided with the arrival of our new Education Co-ordinator, Yolisa, an early childhood development specialist who has come to volunteer her services with Jabulani for a year. The pre-school children, parents and community members came together for the party and much fun was had by all. Many thanks to those who made gifts for the party, and to the many who donated educational materials and monetary gifts. These have enabled us to provide more educational activities and create a more organized and user-friendly storage room. 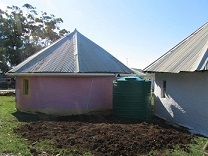 We are also particularly grateful to the Jakob-Friedrich-Schöllkopf school in Germany who are currently fundraising for a rainwater tank for the pre-school, that will provide a year-round supply of water that is safe for drinking. It will also help supply water for the new garden project that is in the preliminary stages of development. With the expert knowledge of a community Gardener, Jabulani volunteers, and pre-school parents, the garden project is set to kick off in the next few weeks. 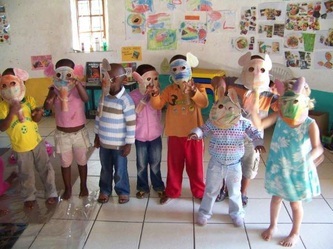 The aim of the project is to support pre-school mothers in being able to grow their own vegetables and to supply the pre-school with school lunches. Furthermore, the garden will be integrated into the curriculum with the children themselves learning how to grow vegetables. The pre-school children continue to develop their skills and show much enthusiasm and joy while learning at school. It seems as though everything is fun, whether it is learning new colours, practicing counting, arts and crafts, discovering new geometric shapes, or learning from books on frequent trips to the new library for storytime!